There’s a Christian fallacy out there that’s really popular. 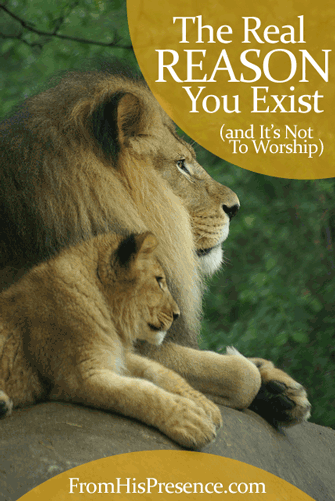 That fallacy is the teaching that the reason you exist is to worship God. There’s only one problem with that: the reason you exist is NOT to worship Him. That’s right. I know people say that the reason you exist is to worship God. It sounds spiritual. It sounds Biblical. It sounds really noble, and worship is spiritual and noble and Biblical and necessary and wonderful and more. I love to worship and am not belittling worship or saying it’s not important at all; it’s one of the most important things we could ever do. But worship is not the reason you exist, and the paradigm that it is has caused a lot of pain in the Body of Christ. Why pain, you ask? Because if people think they exist for the wrong purpose, then they keep trying to fulfill their purpose the wrong way. They end up frustrated and unfulfilled, even when they engage in the most spiritual of activities. We have a lot of people trying to worship their way into fulfillment. So what is the reason you exist? The reason you exist is just to be with Him; to exist in His manifest presence. Jesus died so you could access the Father’s immediate presence. Our purpose for existing cannot be an action that we do. If God needed an action performed, He would have had the angels and hosts of Heaven do it. He has plenty of servants, and He didn’t need any more. He wanted companionship. He wanted a family. He wanted sons and daughters that would just be with Him. I know it seems easy, and it is. And I know it messes with your religious mindset, because “worship-as-the-reason-you-exist” has been taught so long in religious circles. It’s true that Scripture tells us that we were formed to worship, but the context and meaning of the words “formed” and “made” etc are better translated as “engineered for,” like you were made to walk and talk and see and hear. You were definitely made with the ability to worship, and you should worship every moment of every day. When we believe that worship is the reason we exist, we try to fulfill our purpose by worshipping. That’s a problem. We try to fulfill our purpose through an action or a even state of mind and heart–which is still achieved by actions–and by doing so, we fall into a trap of working for acceptance. Yet we could never fulfill our purpose through an action. If activity is the reason we exist, we would be automatons, not sons. If worship is the reason you exist, you would have worshipped, and the cross would not have been necessary. Yet Jesus’ death on the cross was necessary. Why? … and the reason we exist is just to be with Him. We were made not to perform an action, but for a state of being. We were made to be in His presence. We were made for a state of companionship: being with Him. Think back to God’s original design. He made Adam and Eve, his son and daughter, and put them in the Garden, where He walked with them in the cool of the day. They had tasks to fulfill–taking care of the Garden–but their main purpose was just to be sons. They were God’s companions; His family. God’s delight was just in loving them and being with them. He desired to have children, you see. So He made them, and He made them absolutely perfect so He could be with them. That’s why the first mention of our relationship with God (the creation account) was all about Him being our Father and our just being together with Him. It wasn’t about worship. It was about being together in perfect love and harmony. The whole reason He wanted children was just so they could be with Him. They were the object of His affection. You were also made to BE–to simply exist–in His Presence. Why? Because in Him we live, and move, and have our being (Acts 17:28). just as He ch ose us in Him before the foundation of the world, that we should be holy and without blame before Him in love, having predestined us to adoption as sons by Jesus Christ to Himself, according to the good pleasure of His will” (Ephesians 1:4-5). “For through Him we both have access by one Spirit to the Father” (Ephesians 2:18). He chose us before the foundation of the world, that we should be with Him . Jesus laid down His life so that we could know His presence. Now it is our privilege to simply exist in His presence. You were made to be His companion. At that day you will know that I am in My Father, and you in Me, and I in you” (John 14:20). You were made just to be with Him. You don’t have to strive. You don’t have to perform. You don’t have to worship hard enough, sing your song well enough, be popular enough, be skillful enough, rich enough, prestigious enough, or successful enough. You just have to enjoy His presence. Rest and let Him love you with His fierce, strong love. I am captured by His presence, and have become even more gripped by it just writing this blog post. When I think about it, my breath draws up short and I can only whisper. Think of the greatness of this call, this purpose. Think of the greatness of a Father who loved you and wanted you so much that He made you just so He could enjoy your company. Then, when we sinned and could not be with Him anymore, He sent Jesus–Immanuel, God With Us–to bridge the gap so we could enter His presence again. Our fiercely loving Father made us just to be before Him in love. Then He fulfilled our purpose for us, because in Christ we have access to Him and His love. I am captivated by this truth. I was made to be with Him, and so were you. So just let yourself enjoy His presence with you today. Ask the Holy Spirit to help you sense His presence and His affection. And rest. Stop performing. Stop trying to work for acceptance. Don’t worry; your worship and service and love for God won’t go away. They will simply flow automatically as you rest in the main thing. You were made for the Presence of God. He loves you and delights in your company. You were born for His Presence. How does this truth transform your paradigm? Leave a comment below! Image courtesy of Bethany Weeks on Flickr. Totally agree, so over performance, why does the church not teach this? I don’t know. Like you, I wish they did! I think it’s because maybe sometimes people prefer to have a bunch of rules (even spiritual-sounding ones, like “worship is the reason you exist”) because then we don’t have to just rely on the fact that we’ve got nothing, He’s got everything, and all we have to do is receive. Maybe. But it’s true nonetheless. We have a good Daddy God. We have nothing to offer Him in our own natural flesh, but He chooses to love us anyway. I’m undone by His goodness. Saying that we are created to be his companions would suggest that he needed us, which in part isn’t true because it would suggest that he isn’t the highest authority. Any chance you could clarify on that? Hey Crissy. Thanks for asking! You’re right, God has need of nothing. If He needed something, then He wouldn’t be God. But we were still created to be His companions, His family. Not because He needed us–but because He wanted us. Which makes our status as blood-bought sons and daughters all the more special, don’t you agree? Our Heavenly Father didn’t send Jesus because He had to–but because He loved us and desired us so much. John 3:16: “For God so loved the world that He gave His only begotten Son…” (emphasis mine). To think that He did all of this not because He needs us, but because He loves us, makes me cry and whisper. Thank You, Abba Father. This is so comforting that it brings the level of understanding to higher grounds. Praise God for the impact of your difference. Thanks. Needed that at the moment. When brought up to feel worthless unless “contribute”, this is very liberating. Matter of learning to BE!! Have a wonderful day! Thank you so much for sharing! Thank you for this. I use to think I had to be perfect before God. Until I really got into a real relationship with my saviour. I agree with you. To have companionship and just to be loved by Abba Father is our job. Nothing we can do other than to believe in Jesus Christ and acknowledge Him as our Lord and Saviour, can satisfy God. Thanx for mail. Thank you , this is so refreshing and has addressed my confusion . If Jesus walked into our church he would not want us to be worshipping him and treating him as an idol . Yes , he is my saviour , my salvation and I adore him but he doesn’t want fans , what is so awesome is that he would want to wash our feet . Would we treat a dear dear friend as an idol and feel inadequate in their company , in him we are righteous and holy . It is somehow a difficult contradiction that the flesh always opposes the spirit as we do have fallen natures , but how in our need of him , our desperate need at times can we speak to him in nothing but awe and wonder yet allow ourselves to be comfortably ourselves with our Beloved . I struggle to understand at times so thank you so much for echoing how our worship can take away just knowing in stillness his joy and beautiful presence . Thanks, Jamie, This is so good, and so not told. I was a “striver” but never “arrived” It was so frustrating. These old thoughts still pop up at times, and I find myself trying to be that one kid that is seeking approval from my Father. Praise God He wanted me because I want Him so badly. I like this alot. Nice to know that He loves you just because and not for what you can do for Him. I love You too Jesus. Thank You for loving me! ? The conventional paradigm is Performance then you have Identity, and then Acceptance. This is especially so in Asia where earthly fathers usually reward children if they scored well in school examinations. Kingdom culture is the other way round, Acceptance first, Identity follows, and Performance (Worship) would just flow. Jamie, listen to “Here In Your Presence” by New Life Worship. You will be blessed! I can’t stop crying alone reading this! GOD BLESS YOU! hi J, isn’t worship made us feel more of his presence?